CNBC sheds light on the millions of dollars that Practice Fusion’s executives will reap when the company’s fire sale to Allscripts at 1/15 of its one-time, self-assessed value is completed. Practice Fusion stakeholders say they were misled by an executive team that was touting a a bright future even as growth was stalling, founder and CEO Ryan Howard was fired, headcount was slashed, and the company had pitched itself to 40 potential buyers starting in November 2015, receiving bids at just $50-225 million for the company that had valued itself at $1.5 billion in early 2016. A group of employees is trying to assemble enough voting shares to remove the payouts to the executives. Allscripts was the original bidder at $225 million, but backed out when EClinicalWorks was hit by a $155 million settlement related to falsifying EHR certification testing results. Allscripts came back with its offer of $100 million in cash, which Practice Fusion accepted on January 8. Mediware Information Systems acquires RCM company MedTranDirect for an undisclosed sum. Change Healthcare retains the exclusive right to license commercial data to WebMD Health Corp. It seems there was some legal disagreement over which company had the rights to sell de-identified data to third parties after the parent company of both businesses sold them off. Audacious Inquiry takes in its first outside investment, with Baltimore-based ABS Capital Partners buying an unspecified stake. Allscripts is apparently still struggling to bring Professional EHR and PM back to normal following last week’s ransomware attack, with reports that some customers can’t access the system through the desktop application. The company also warns that the restored system might be slow and suggests that customers use the mobile solution when possible. Analytics Platform and Clinical Data Warehouse are still down. Major Health Partners (IN) will implement Meditech Web EHR. Intermountain Healthcare will transfer 2,300 billing employees to its revenue cycle vendor R1 RCM, expecting to save $70 million in the next three years even though the employees will keep their pay rate, health insurance, and tenure at Intermountain. The health system’s COO, questioned by employees worried that the company will outsource its IT operations that include its Cerner system, says Intermountain has not yet made any IT decisions but needs to manage its costs. 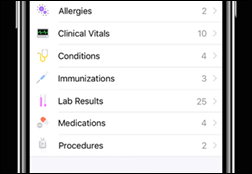 Apple announces new beta functionality within its Health app that will let patients at a dozen partner hospitals view their medical records on their IPhones. Participating EHR vendors include Epic, Cerner, and Athenahealth. More detail and insider reports here. ZeOmega adds Change Healthcare’s InterQual Connect authorization connectivity and medical review service to its Jiva population health management software. The VA will use data, analytics, technology, and best practices from CMS to combat fraud and abuse within its programs. One Brooklyn Health (NY) will use a $700 million investment from the state’s Vital Brooklyn plan for technology and facility improvements to its three hospitals, plus the creation of a 32-facility ambulatory network. 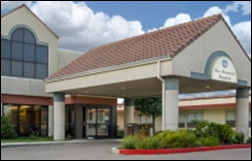 Technology upgrades in the $70 million range will include development and installation of a system-wide EHR. The hospital believes the hackers were members of an Eastern Europe criminal group. They obtained (by unstated means) the login credentials of one of the IT department’s hardware vendors. The hackers then attacked a server at the hospital’s backup site. To stop the ransomware’s spread, the IT department had to immediately shut down all network and PC hardware, not easy since the attack was launched in the evening when many PC-using employees had left for the day. The hospital decided to pay the $55,000 ransom when it found no good way to remove the encrypted files and replace them with backup copies because the connection between the backup and live sites was compromised by the ransomware. They later found that the backup files had also been corrupted by the ransomware, which would have required paying the ransom in any case. Employees struggled to figure out how to buy Bitcoin, but once they paid the ransom, the hackers restored the system quickly. 36 percent of poll respondents (C-level company execs and investors) say health IT is in a bubble vs. 29 percent in 2015. The health IT market needs to grow 7-13 percent annually to support the current rate of investment. The market pushes companies to balance the long-term value creation caused by serving customers while catering to investors who expect them to innovate using buzzword-worthy technologies such as AI and blockchain. 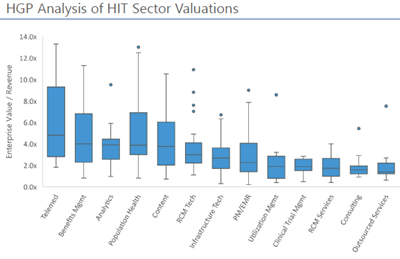 The most actively sought acquisitions are in population health and analytics, RCM technology and services, payer services, and infrastructure technology. Hospitals as a target market led the way by far. The most important acquisition characteristics are growth trajectory and recurring revenue, while strong management finished last. Most executives say the regulatory impact of the Trump administration won’t affect their company’s performance or acquisition strategy. 2017 saw zero health IT IPOs following nine, eight, and five, respectively, from 2014 to 2016. 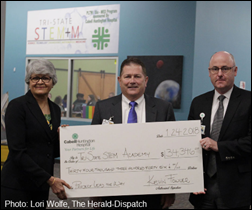 Cabell Huntington Hospital (WV) donates $35,000 to Tri-State STEM+M School, with its VP/CIO Dennis Lee (right) making a classroom visit along with the hospital’s CEO. MedData will exhibit at the ASA Practice Management meeting January 27-29 in New Orleans. Medecision will host its annual Liberation conference March 27-29 in Dallas. Major Health Partners (IN) will implement Meditech’s Web EHR. Netsmart will exhibit at the NY Coalition for Behavioral Health Annual Conference February 1 in New York City. Clinical Computer Systems, developer of the Obix Perinatal Data System, will exhibit at the Society for Maternal-Fetal Medicine’s Annual Pregnancy Meeting January 31-February 3 in Dallas. Infor will launch a cost analytics and accounting tool for providers this summer. 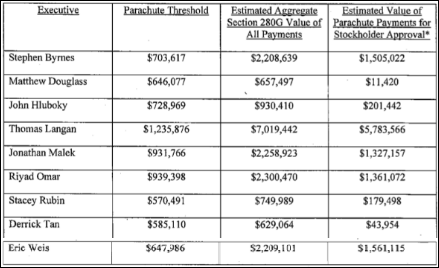 So Allscripts offered more originally than they eventually paid McKesson Paragon? What does this say about their current understanding of the satisfaction with their own physician practice offering? What does it say to current Paragon customers? This is no surprise to many of us. I have been commenting here for years that PF was inflating (?lying about) it’s number of users. This is just a continuation of that pattern.